Following the passage of Colorado’s renewable energy mandates, Boulder County sought out financing partners to operate solar projects, whereby the County could switch its energy consumption to become more “green friendly”. 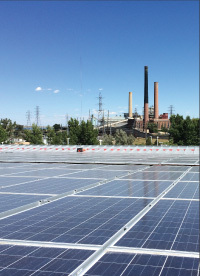 Following the negotiation of a Power Purchase Agreement, RC Energy Group and its contractor partners began construction of solar facilities on the rooftops of Boulder County’s buildings. With a first project completed in late 2008, RCEG began to sell electricity to the County. By the end of 2014, RCEG had completed 13 installations, which are a combination of roof mounted (using attached and ballasted systems) and ground mount locations.